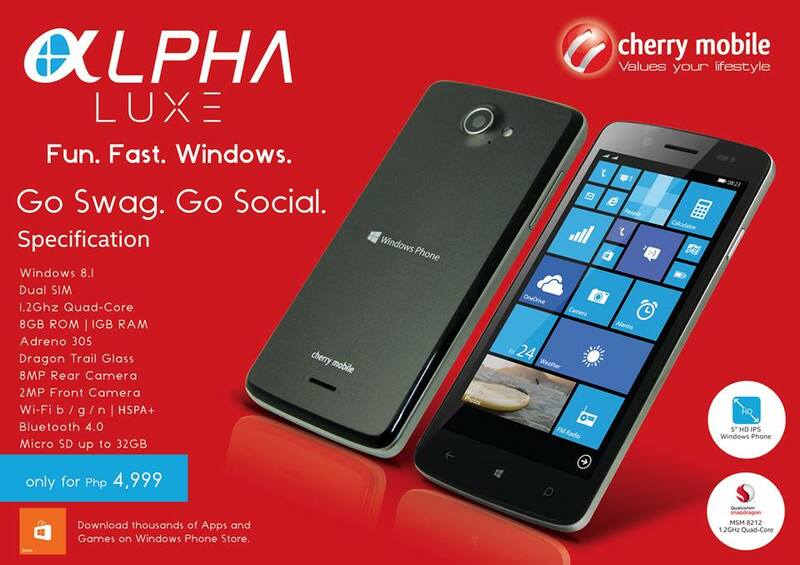 Home Event Cherry Mobile Alpha Luxe Announced: Cherry Mobile’s First Windows Phone! Cherry Mobile Alpha Luxe Announced: Cherry Mobile’s First Windows Phone! Cherry Mobile, the No. 1 local smartphone brand is finally making Windows-powered devices! Microsoft’s operating system is now the 3rd OS when it comes to number of users behind Google’s Android and Apple’s iOS. Cherry Mobile has just announced its first Windows Phone device, the Cherry Mobile Alpha Luxe! You’ll be surprised how much will this smartphone will cost. The official SRP is only P4,999! After watching Apple’s announcement of the iPhone 6 and iPhone 6 Plus, the announcement of a Windows Phone-powered Cherry Mobile really made us so excited! We will definitely secure a review unit!